Yesterday morning was the River Run Classic. The race started at 7:45am so we left the house right around 7am in the hopes that we would be able to find decent parking. Yeah right! I looked at the overall results online tonight and there were over 500 runners registered in the race, including 5k, 10k and half marathon runners. Parking was a nightmare and after we got chewed out by an old man with nothing better to do at 7:25 on a Sunday morning for parking in his precious parking lot at his condo (I saw no signs indicating we couldn't park there), Jay just dropped me off and said he would do his best to find parking. He ended up hanging out at the parking lot of Lawson Heights Mall until closer to when he thought I would be done and circled the block a few times and finally my sister saw him and just told him to park in a non-parking zone because at this point no one was going to care! So he did and just got set up in time to get a shot of me coming toward the finish line. I enjoyed running the 10k. 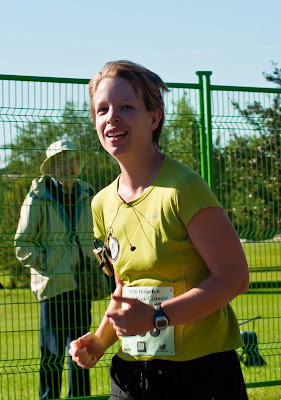 I think I enjoyed it more than the Mogathon because there were so many runners. I definitely wasn't the fastest (I still don't understand how people can keep up that pace for 10k!) but I wasn't the slowest either. According to the final results I came in 221 out of 253 runners doing 10k. There were 23 people in my age group (20-29) and I came in 21st in my age group. My time to complete 10k was 68 minutes and 12 seconds. I think that is a very respectable time for someone who has never actually ran 10k before. I have run 8 or 9k a couple of times, but never the full 10k. And I actually ran the majority of it. I took a few short (30-60 second) walks and I walked through the water stations (I learned during the Mogathon that I do not jog and drink well at the same time *choke*). Here are a couple of pictures. 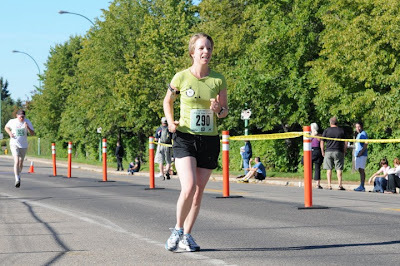 The first one I snagged from the Saskatoon Road Runners Association website. I didn't realize they had a photographer covering the event. The second is taken by Jay.